Call him s/o Iskandar Kutty at your own peril! TTDI, 3 Aug 2017: Deputy Prime Minister Zahid Hamidi has yet to respond to his ex-boss' allegation that he had RM230 million in his bank account some 20 years ago. Until then, I will assume that Dr Mahathir Mohamad was telling the truth (even though Mahathir admits there is no proof that Zahid had RM230 million in his account). 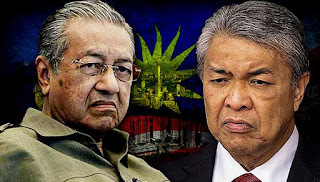 But because Mahathir Mohamad took no action against Zahid following the so-called discovery, I will also assume that the RM230 million wasn't ill-gotten money. Or perhaps it was not so out-of-the-ordinary for Umno politicians to have that kind of money during Mahathir's era. If a just-appointed Umno Youth chief had that kind of money in his bank account back then, just how much did the Umno president have in his? i think you are becoming more like dr mim and unspinner. If so, it was unintentional. I do have regards for Dr MiM and The Unspinners. They have stayed the course. Readable. Informative. Fake-free. "I do have regards for Dr MiM and The Unspinners. They have stayed the course. Readable. Informative." LOL, ohhhhhhhh Latuk, you're so cute! "He has stayed the course. Readable. Informative. Fake-free." Mahathir himself should answer allegation that he has taken rakyat's money 100-200 billion, which has been questioned very much earlier, before asking others to answer his allegation.